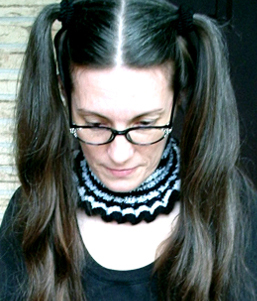 An independent knit and crochet designer since 2009, Amanda has been knitting and crocheting longer than she can remember (she was taught by her mother at a very early age). With a creative streak, she rarely works from published patterns, preferring to develop her own designs. Inspired by her daughter’s first published pattern, Amanda started publishing some of the many designs in her files. She has created both knit and crochet versions of her popular Gypsy Turban and Witch Warmers patterns. She especially loves designing “do-good” patterns that use recycled materials, reduce the amount of throw-aways in our lives, or spread love in the form of a prayer shawl or afghan. With a master’s degree in library science and many years as a technical writer, editor, and graphic designer, Amanda came to the field of pattern design with the skills needed to produce clear, well-written patterns. Her colorful, carefully crafted pattern downloads are a testament to her love of both knit and crochet, and communication. Amanda lives on the Texas Gulf Coast with her husband and two cats.